The most important part of a rabbit’s diet is good quality hay together with fresh grass. This is what they eat naturally, so it should make up the bulk of the diet and be offered all the time. 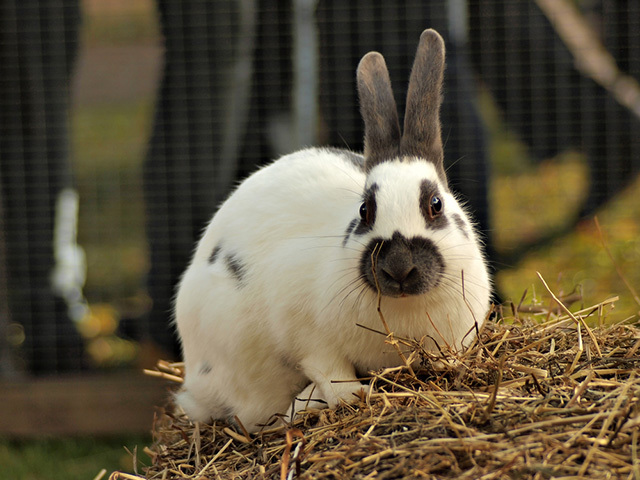 Hay and grass provide essential fibre that keeps the teeth and digestive system in good health and nibbling throughout the day will keep your rabbit occupied and prevent boredom. Hay racks or nets can minimise any mess formed. Good quality meadow hay should be sweet smelling and not dusty. A good idea is to try and obtain hay from a farm or feed merchant but check that wild rabbits have not had access to stored hay. Dried grass products that retain the green colour and are highly palatable are also now available. A large number of rabbits will only eat certain components of mixed feeds, risking an insufficient uptake of protein, calcium and phosphoros. This is why high quality dry pellets, where all nutrients are present in each individual pellet is the preferred option. Overfeeding dry foods to adult rabbits is a common cause of diseases such as obesity, heart and liver problems, chronic diarrhoea, dental and kidney disease. Water should be available 24hrs a day and water bottles or bowls should be cleaned daily to prevent the build-up of bacteria and contamination. 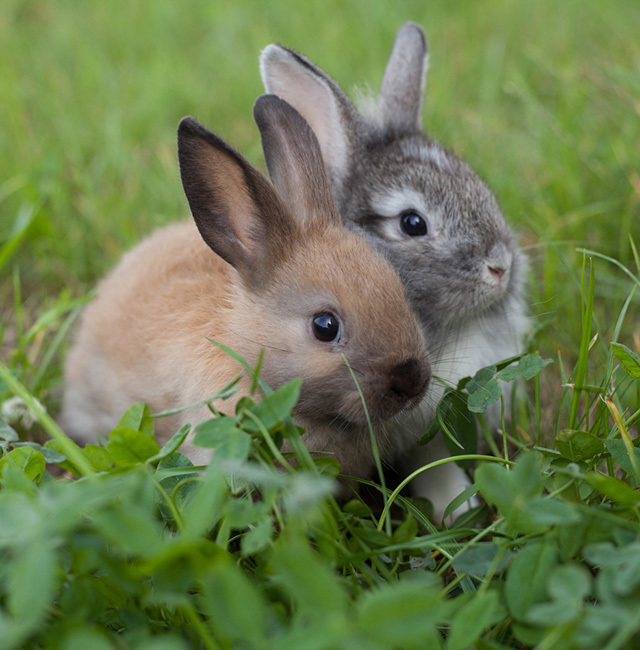 You can feed your rabbit limited amounts of fresh vegetables, fruit and greens daily. Wild plants are also greatly enjoyed. If your rabbit is not used to getting fresh food though, it’s best to begin by feeding green leafy vegetables, adding a new type of vegetable every two-three days. If the addition of any item leads to diarrhoea within 24-48hrs it should be withdrawn. Fresh foods should not make up more than 20% of the rabbit’s diet. Items to try are Chinese cabbage, watercress, kale, parsley, spinach, radishes, celery, bramble, raspberry leaves, dandelions, chickweed, plantain, groundsel and clover. Do not feed your rabbit chocolate, biscuits or other sugary treats like honey sticks, bread, or fatty, salty foods like potato crisps. Be careful with feeding treats generally as they can lead to obesity and digestive upsets. Treats your rabbit may like include strawberries, pineapple chunks, apples, pears, melon slices, banana slices, raspberries, peaches and dried fruits. However, fruits are high in sugar and should only be fed very occasionally as they can lead to dental problems. For good tooth wear you may provide your rabbit with twigs or tree branches and he or she will enjoy gnawing and stripping the bark. A general rule is that you can offer branches from any tree that we eat the fruit from such as apple, pear or plum but do make sure that the tree has not been sprayed with chemicals.